FHQ gobbled up all of the late week polls that were slow emerging over the weekend. That made for a quiet Monday and obviously no change to the current outlook. On Tuesday, that changed. All has been quiet on the Florida front since the surprising +5 Obama poll was released out of the Sunshine state by Survey USA over a week ago. Public Policy Polling was in the field over the weekend, however, and found what a great many of the other polls in the state have found: a dead heat. Most polls since May have shown a race that slightly -- and I mean slightly -- favors the president, but one that rarely indicates a race anymore than +4 in one direction or the other. The PPP poll was the same with (likely voter) respondents giving Obama a 48-47 edge. Last week, FHQ wanted to call Missouri underpolled, but three polls later, perhaps we have a clear reason why that has been. Mitt Romney simply -- and not all that surprisingly really -- holds a comfortable advantage in the Show-Me state. Mind you, Missouri has never been any closer than three points -- in an April Rasmussen poll -- and the existing Republican margin in the state has been highlighted even more after this latest flurry of polling activity there. In a steady race, Missouri has been pretty steady and will likely remain that way: Steady Romney. What do either of these polls mean for the map or the Electoral College Spectrum? Well, nothing really. The map is stationary. Meanwhile neither poll shifted either state much at all, since both were consistent with the prevailing weighted average anyway. Missouri is in Romney's column and Florida is the first line of defense -- albeit one with a tenuous but consistent to this point grasp on the position -- on the blue side of the ledger. Somewhat surprisingly, trading out a +5 Obama poll for a +1 Obama poll did not have all that big of a statistical impact on the FHQ weighted average. The margin only dipped .02 of a point. Importantly, that keeps Florida off of the Watch List. Here's another Friday leftover out of Missouri and a couple of Pennsylvania polls from Susquehanna. Maybe St. Louis wasn't really a feasible alternative to Charlotte as a site for the Democratic convention (if the goal was to win the state in which a convention is held). More than anything, Missouri looks less like the reliable bellwether it was throughout the 20th century and more like a comfortable Republican state. Granted, there just has not been that much polling conducted in the Show-Me state, but Missouri has not really "felt" as close as the polls before this past week had indicated. By FHQ's measure, Missouri was straddling the line between a Toss Up Romney state and a Lean Romney state. Was is the operative word. After a couple of +9 Romney polls this past week (Mason-Dixon and We Ask America), the weighted average for Missouri has pushed Romney's advantage over the president in the state into the heart of the Lean category. Interestingly, the percentage margin in Missouri in November 2008 was nearly 7 points behind the overall popular vote margin. McCain won the state by just .13% while Obama won the national popular vote by a little more than 7 points. I don't want to read too much into this based on polls in or before July, but now in 2012 Missouri is a tad under 7 points in Romney's direction while Obama is widely seen as having a slight advantage nationally. Again, that makes for an nice footnote, but little else at this point. A question I like more is why Missouri and Indiana have jumped more quickly to the right in surveys thus far in 2012 and North Carolina has not. Those three states were the closest states overall in 2008. Why, then, has the pendulum swung in Missouri and Indiana and not North Carolina? North Carolina has not exactly been underpolled, yet consistently never gives either candidate much more than a 1-3% edge. FHQ will pass on expounding too much on the state of the race in Pennsylvania. On numbers alone, Pennsylvania is to Obama what Missouri is to Romney. [Yes, that is an overly simplistic view.] Instead, let's focus on the addition of a couple of Susquehanna polls -- one of which is from March and has been missed by a number of other survey aggregators out there. First of all, Susquehanna is a Republican polling firm, and early on seemed to have a bit of a rightward house effect. Romney led a February poll of Pennsylvania and was tied with the president there in a late March survey (see above). One would expect that to serve as something of a drag on the weighted average -- and it does -- but that impact is muted. Recall, that the weighted average discounts older polls. And those February and March polls are pretty heavily discounted at this point. Still, the addition of the two polls did pull the average down some, but not nearly enough to bring it into Toss Up range. I should also note that Susquehanna also polled Pennsylvania in June and found Obama ahead 48-43. However, that poll is not included either above or in the averages yet because the dates the survey was in the field are unknown. As such, FHQ cannot accurately weight the poll for inclusion in our weighted average. Of all the Susquehanna polls, that June poll is the most consistent with other surveys of Keystone state voters. Arbitrary though the lines of demarcation between state are, the current Toss Up, Lean and Strong configuration has done a better job of sorting red states than blue states. That is reflected in a much bluer Watch List below. Of course, the Watch List is to some extent a hostage of where polling is being conducted. There is more volatility/more polling in a group of bluish Toss Up and Lean states than anywhere else. The only red state of consequence now is North Carolina. 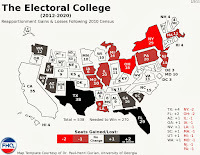 Neither Georgia nor West Virginia are states that are going to shift toward Obama much less cast their electoral votes for the president. That said, the list just lost another red state, Missouri. 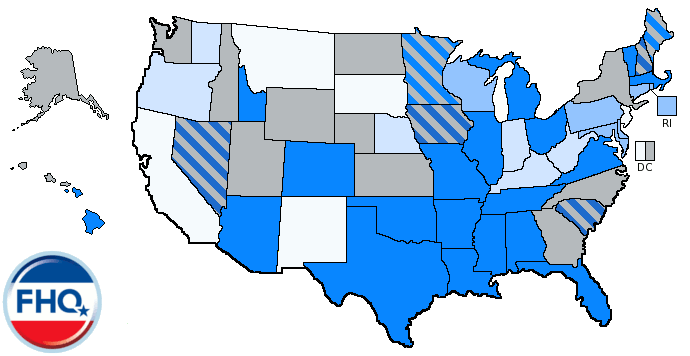 The Show-Me state, as was mentioned above, has shifted more toward Romney and more firmly into the Lean category. What a difference four years makes. At this point in 2008, North Dakota was a toss up state by FHQ's measure; closer than eventual blue states Florida, Indiana and North Carolina.1 That is either an indictment of the methodology or a cautionary tale about placing too much faith in the predictive power of polls conducted during or before July. Given how things ended up in November, I am comfortable saying it was the latter. The 2008 polling of the Peace Garden state up to July showed a race in the low to mid-single digits (in both directions: Obama & McCain). North Dakota ultimately ended up in the McCain column in November, but the Arizona senator's advantage in vote share was just less than 9 points. In July that would have been a Lean McCain state. In 2012, Romney's advantage -- according to FHQ's weighted average -- is about eight points greater than the Republican vote share in 2008 and more than 15 points greater than the simple average of polls at this point in the race in 2008. North Dakota is firmly on Romney's side of the ledger. I said quite a bit about Ohio yesterday, so I'll keep it brief here. This Magellan poll at +2 Obama is probably a better snapshot of the Buckeye state than the +8 Obama We Ask American survey. It is closer to the FHQ weighted average anyway. In the terms of yesterday's discussion, the Magellan poll finds Obama at the very bottom of this Ohio range and Romney right in the middle of his more widely dispersed set of poll points. Look, Ohio is going to be right there as a potential tipping point state unless something comes along to fundamentally alter the outlook of this race. A Portman selection as Romney's running mate would change things, but probably not enough to consider that the type of fundamental shift to which I'm referring. But it would have an effect. 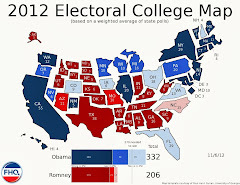 Neither poll did enough to the weighted averages in either state to change the electoral college map. The Electoral College Spectrum saw North Dakota switch places with Mississippi, but that is more a cosmetic change than a consequential one. Again, North Dakota is a Romney state and that isn't going to change. The We Ask American Ohio poll put the Buckeye state on the Watch List, but the Magellan poll recalibrated the weighted average just enough to pull it back off again. Other than that the list remains unchanged. 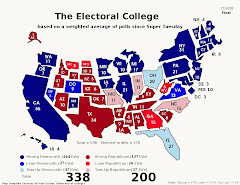 1 Note that the July 30 electoral college post in 2008 is when the at that point yet to be named -- or fully formed for that matter -- Electoral College Spectrum made its first appearance.